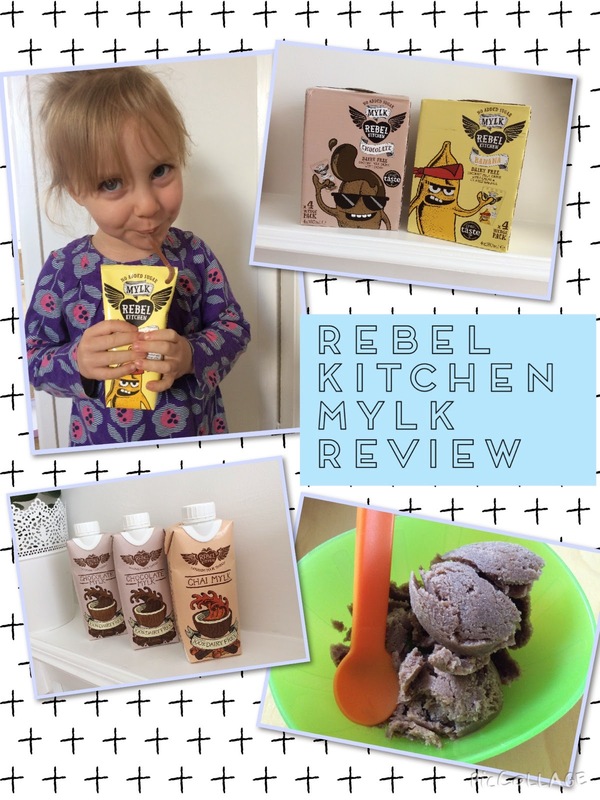 Rebel Kitchen Mylks are perfect for us as a family. No dairy, of course, but also no refined sugar and that is important. So what do the mylks contain? Spring water, coconut milk, organic date nectar to sweeten plus cacao and crushed banana in the chocolate and chocolate-banana kids mylk pouches and chai flavourings for the chai mylk. Really simple ingredients. They say "if you can't say it, don't eat it!" which I absolutely agree with. I had banned poor Rob from sneaking off with a carton of chocolate mylk, so he begrudgingly went off to work on his bike with a 330ml carton of chai mylk. And he really enjoyed it, so much so that he requested the other one a few days later. He found the chai mylk to be really flavoursome and refreshing but despite giving the carton a jolly good shake before opening, some lumps remained. He wasn't bothered though. Lily enjoyed her first kids chocolate-banana mylk pouch with straw whilst out on an impromptu family picnic and she adored it. I had a try too - it tasted pretty sweet so I don't think I could drink a whole pouch. It didn't taste sweet in a synthetic way, but the date nectar flavour was overpowering for my tastes. No lumps too! Whilst having another picnic (this time beside the sea), my cousin and I enjoyed a chocolate mylk kids pouch. It was pretty decadent and too good for kids in my opinion! It wasn't overly sweet and it was very refreshing. I wanted to experiment with using a flavoured coconut mylk in the kitchen, I particularly wanted to see if I could make ice cream which the whole family could enjoy. I thought carefully about how to make ice cream with coconut milk as it is mostly water and has a low fat content. Therefore I decided to use Lactofree semi-skimmed milk in addition to the Rebel Kitchen chocolate mylk. So whilst it wasn't dairy free it was lactose free and it would make Rob's tummy happy and I would be happy that he is able to enjoy some delicious ice treat. I followed my own tried and tested ice cream recipe but swapped the 500 ml of Lactofree cream for a 330ml carton of Rebel Kitchen chocolate mylk and the rest was the semi-skimmed milk. Whole milk would have a higher fat content and would result in a creamier ice cream, but semi-skimmed milk was all I had. I made a custard using 5 egg yolks, the milk combinations and 175g castor sugar. The custard looked a bit on the split side, but I persevered. It set pretty rock solid in the tub after being frozen for several hours despite churning using a stand mixer, but that was due to the lack of fat. A few minutes of the tub sitting out of the freezer, or in our case, in the inside of the oven with residual heat, worked a treat and I was able to serve Rob, myself and Lily some bowfuls of chocolate mylk ice cream. And it tasted pretty good! A little bit icier than full- fat ice cream but I was able to scoop it out in a semi-presentable fashion. Rob really enjoyed it. So much so that the tub only lasted about 24 hours. I let him dig in as it is rare that he is able to eat ice cream. Swedish Glace is nice but homemade is better! He definitely wants me to make it again. Perhaps next time I will try a chocolate and coffee coconut milk combination.